This post is brought to you by a compensated campaign in collaboration with Latina Bloggers Connect and Wells Fargo. All thoughts and content are my own. 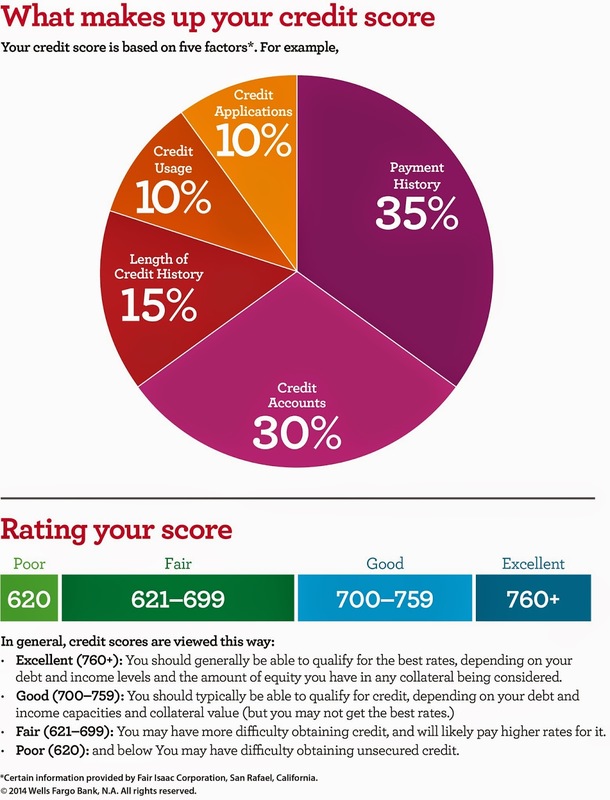 When I was younger I had no idea how important good credit would be for my future. I married very young and since I was completely clueless in regards to my credit, I didn't take care of it the way I should have. By the time that I divorced, my score had hit bottom after I was left holding the bag on many unpaid bills. Divorce can be very hard and a definite stressor when it comes to your credit, especially when you don't know what you're doing. It was then up to me to educate myself on how to repair my credit. The road to good credit since then has been long, but I am a perfect example of how it is possible to climb out of the bad credit whole. Right now I have already raised my score substantially and am actively working on keeping it healthy. I'd like to share a few tips that have helped me raise my score and become a better money manager. Make sure your credit report contains current and accurate information. Errors could negatively impact your credit score and even be a sign of possible identity theft. Request a free copy of your credit report at least once a year from AnnualCreditReport.com or call toll-free 1-877-322-8228. Your payment history is one of the biggest factors in your credit score – including things that may surprise you like on-time payment of your rent and cell phone bill. Using free online tools, often available through your financial institution’s online banking, can help you develop a budget and create an automatic bill payment schedule. Prepare a budget and track your spending. As part of that commitment and in order to connect with the Hispanic community in a meaningful way, Wells Fargo recently collaborated with Telemundo for the "Conversemos de Tus Finanzas" campaign. The campaign is focused on empowering Hispanics to enhance their financial knowledge and help them to reach their financial goals. The campaign provides customized content, tools and resources around the important financial topics of money management and credit. I can not stress how important good credit is for your daily life. Everything from finding a suitable place to live to getting a home one day, is based on that one score. Even while on a budget it is still possible to build credit and learn better money management. The trick is to get educated and then use all those tips and tricks to help you stay on top of everything. For additional tools and resources, please visit Wells Fargo online.